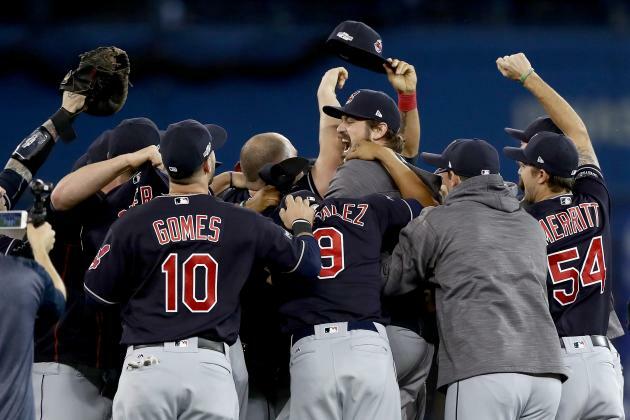 Cleveland went 52 years without a major sports championship, but is now on the cusp of, perhaps, winning two titles in the same year. With the Indians capturing the ALCS last night, they will open the World Series the same night the Cavaliers will raise their championship banner, next Tuesday. Cleveland's past futility was on full display in the ESPN 30 for 30 "Believeland," which debuted just before the Cavs won the 2016 NBA Finals. The film not only listed the town's numerous on-field heartbreaks (of which there are many), but also the off-field issues that have shaped the psyche of Cleveland fandom. The Browns skipping town and "The Decision" were chief among them, obviously. But now that Cleveland may be ready to win two titles in one year, a feat that only rival Pittsburgh has achieved in the last decade, is the math finally catching up? Well, sort of, but as you'll see, Cleveland will need far more success just to reach the average performance of a major sports market over the past 50+ years. Listed below are the 19 other American markets with three or more professional sports teams, and all of their titles since 1964 (the last Cleveland championship before this year). 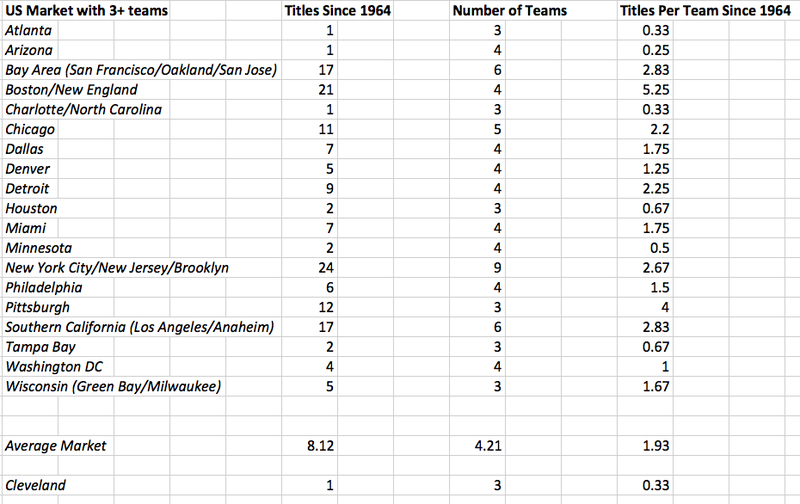 We've then broken it down and listed an "average titles per team" figure for each market over that time span, and averaged out what a given market could have expected to win since 1964. All this to give you an idea of how far below the mean Cleveland was/is. Ed. Note- Though I love the MLS and several other pro sports leagues, for the sake of this piece we're going to stick to America's four major pro leagues, the NFL, NBA, MLB and NHL. 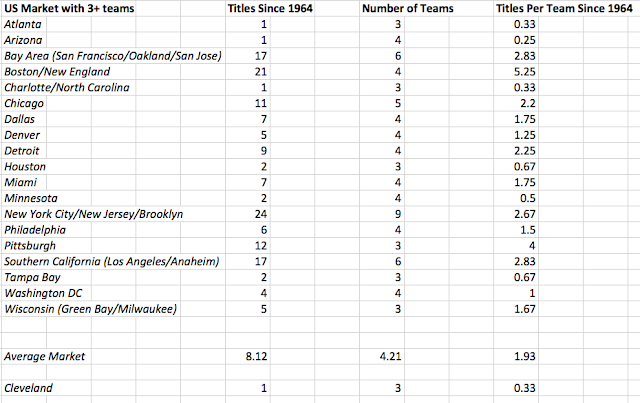 As you can see, a few markets have really bumped the mean number of championships and titles per team up. Most notably, Boston and Los Angeles benefited enormously from the NBA dominance of the Celtics and Lakers, respectively, while New York rode titles by the Yankees, and Pittsburgh took advantage of the fact that it has only three teams, but all of them have won multiple championships. As for how that affects Cleveland, and its recent run of good fortune… Well, bad news, because even if both the Indians (looking good) and Browns (not so much) win championships this season, that will leave the city at just 1 title per team since 1964. That's just over half the national average so, while it seems like the math is finally catching up for Cleveland, this city's tortured fans actually deserve far more than they're getting this year. But hey, it could be worse. Cleveland could be Arizona... Well, it couldn't be because of the weather, but you get my point.